Ascension is a music-loving parish. At our 10:00am Sung Mass on Sundays, we sing most portions of the Mass, as well as psalms and hymns. Our music is traditional, reverent, and joyful. Selections come from the Hymnal 1982 and the old and new classics of sacred music. 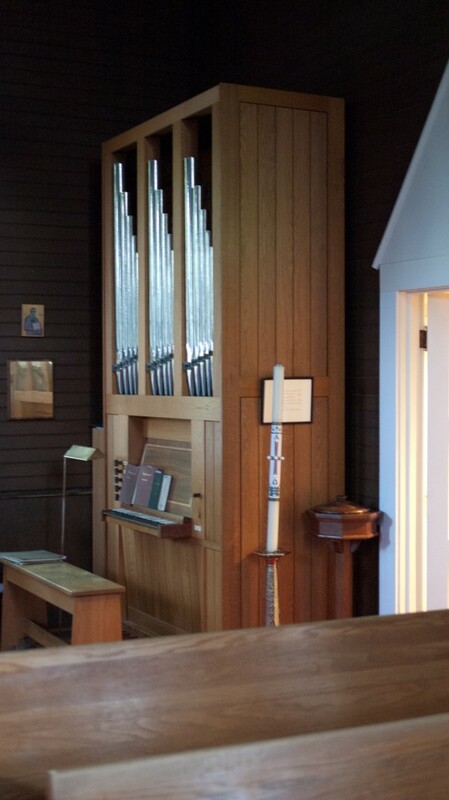 At 10:00am Sung Mass, our worship is accompanied by the sound of our one-manual, five rank Coulter organ, a unique baroque-style tracker instrument which is ideal for Renaissance and Baroque organ repertoire. The hymn accompaniment style is intended to encourage joyful, confident singing by the congregation. At a typical Sung Mass, the congregation will sing settings of the Rite I Mass from The Hymnal 1982, as well as four to five hymns and a chanted psalm. Our worship is also often enhanced by musical offerings from vocal or instrumental soloists. Our Parish choir is composed of members of our congregation and guests who love to sing! The choir sings a Festival of Lessons and Carols service each year in December, as well as singing anthems and motets for special services such as Christmas Eve, Maundy Thursday, Easter Sunday and Ascension Day. The choir is open to singers aged teen to adult. Rehearsals for the Advent season take place October - December at 9:00am on Sundays. Rehearsals for Holy Week take place on Sundays at 9:00am from February until Easter. Our choir focuses on classics of the Anglican choral literature, and rehearsals are accessible and fun. If you are interested in joining us, please email our Minister of Music, Emma Mildred Riggle. Our lovely historic chapel boasts a generous acoustic, and it is an ideal venue for intimate chamber performances. Vocal soloists frequently join us for worship services, and our chapel has also hosted recitals by singers, organists, string players, early music specialists and more. Our beautiful parlor is another fine venue for recitals, with its restored historic Chickering grand piano. Recent concerts in our parlor have included classical song recitals and jazz performances. In honor of International Women’s Month, we are offering a concert of motets for voices and organ by Isabella Leonarda (1620-1704), one of the preeminent women composer of the Baroque period. Our program will include motets, by turns joyful and meditative, composed for two and three voices, and accompanied on our Coulter Baroque tracker organ. The program will also include the Suite in D minor from Pièces de clavecin Book 2 by Elisabeth-Claude Jacquet de la Guerre (1665-1729). On Maundy Thursday, the Ascension Choir will lead us in a Choral Mass featuring plainsong settings, and motets by Fauré. Join us on Easter Sunday at 10:00 A.M. for a festive Mass to celebrate the Resurrection of Our Lord. The Ascension Choir will lead us in beloved hymns and anthems of the Anglican tradition. A guest concert of vocal chamber music from the Renaissance, including works by Palestrina, Lasso, Monteverdi, d'India, and Robert White and featuring antiphon settings by David Foley (b.1981). A recital of music by sacred early music by women composers for voice and organ, performed by Dr. Samantha Arten of St. Louis University. The concert will take place in our Sanctuary and feature our Baroque tracker organ, and will include works by Isabella Leonarda, Barbara Strozzi, Francesca Caccini, and others. A collaboration between the music programs of Ascension Parish and St. Michael and All Angels Church, this recital will feature music by women composers of the Romantic period, including piano solos, piano duets and art songs by Fanny Mendelssohn Hensel, Clara Schumann, Amy Beach, and Lili Boulanger. Minister of Music Emma Mildred Riggle serves as organist and choirmaster at Ascension. Please contact her with any questions about our Ascension music program.